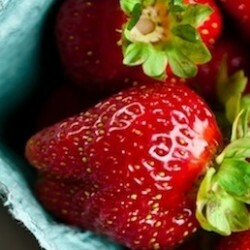 Season for Strawberries: Late May / early June through the end of June / beginning of July. Finished for 2018. Check back for our 2019 pricing. Avoid pale red berries and berries with green tips. Strawberries will not ripen after you pick them! Pick all the ripe berries, big and small. Smaller berries are often sweeter. Sweetness also depends on the variety. When picking, be sure the cap, or green top, remains on the strawberry by pinching the stem of the berry between your thumb and forefinger. Visit our Pinterest page and our blog for recipe inspiration!